Pro wrestling legend "The Fabulous One" Jackie Fargo, a longtime favorite in the Chattanooga area, died Monday at China Grove, N.C.
Born in Concord, N.C., on June 26, 1930, he was the son of the late Lewis and Delmer Swink Faggart. Fargo began his career with his brother, Roughouse, and was famous for wrestling primarily with the National Wrestling Alliance in the 1950s, continuing into the 1970s. He held tag team gold championships 45 times throughout his career and originated the famous "Fargo Strut", still implemented today by wrestlers including Ric Flair, Jeff Jarrett, and The Fabulous Ones. 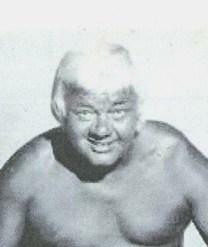 Included in his lengthy wrestling career, he was awarded the NWA Mid-America Heavyweight Championship 3 times. Fargo was also credited for launching many careers such as Jerry "The King" Lawler. Fargo was inducted into the Wrestling Hall of Fame in 2009. Retired in the late 1980s, Jackie maintained close relationships with the wrestling community and enjoyed appearances throughout the 90s and early 2000s. On June 19, 2002, Fargo appeared on the very first NWA TNA weekly pay per view along with other NWA legends. Noted for his outlandish and entertaining antics in the ring, Jackie will also be remembered for his warm smile, bigger than life personality and wonderful sense of humor. In addition to his parents, he was preceded in death by his wife, Judy Stafford Fargo, and brothers, Robert Faggart, Sonny "Roughouse" Faggart and sister Kathleen Orbison. He is survived by his daughters, Brandy McKinney (husband Greg), of Salisbury; Charlotte Fargo Jacobs of Memphis, and Jackie Mae Fargo Jacobs of Orange County, California; granddaughters, Ashley Nicole Jacobs and Jennifer Hope Jacobs; grandson, Justin Jon-Fargo Jacobs and two great-grandchildren. The family will be receiving friends at Linn-Honeycutt Funeral Home in China Grove on Wednesday at 6 p.m. followed by a celebration of Jackie's life, officiated by Bobby Fulton, in the Linn-Honeycutt chapel at 7 p.m. Graveside services will be on Thursday at 9:30 a.m. at West Lawn Memorial Park in China Grove. Memorials may be made to Faithful Friends Animal Sanctuary, 220 Grace Church Road, Salisbury, N.C. 28146.